I'm running the Boston Marathon! I thought all I had to do to participate in the Boston Marathon was run a sanctioned marathon in under 4 hours, 5 minutes. On 10/10/10, as described in my last post, I ran the Mohawk Hudson River Marathon in 3 hours, 59 minutes, and 12 seconds, over a 32 minute PR for me. That more than qualified me. Boston, here I come! Registration for the Boston Marathon opened up on Monday, October 18, at 9:00 AM. I checked out the website, and saw that all I needed to do was complete an online registration. How hard could that be? I remember reading that last year, registration maxed out about 2 and 1/2 months after the registration opened. In prior years the registration lasted longer, 3 months, 4 months, even right up until the race in mid April. But I really, really wanted to run this race that I had trained so hard for. So, rather than waiting a few months, or even a few weeks, to register, I was ready at 9:00 AM that Monday morning. Ready meaning I had two computers on, with two different internet browsers going. As a baby boomer growing up in a heavily populated suburb of New York City in the 1960's and 1970's, I practically came out of the womb knowing I had to compete hard for scarce resources. It took until 11:30 AM to get onto the site and complete the registration. I thought I had it tough, trying to get registered for 2 and 1/2 hours, until I read the Boston Athletic Association website that night. For the first time in 115 years, the Boston Marathon sold out in eight hours. Anyone who tried to register after 5 PM that Monday was out of luck, as was anyone whose qualifying marathon was scheduled for after October 18th. But as difficult as registration was for me this year, consider what a hard time Kathrine Switzer had trying to get into the Boston Marathon in 1967. She was the first woman to officially run the all male Boston Marathon. She registered (although not online!) as K. Switzer. She began the race, in a baggy sweatsuit, but sharp eyed Jock Semple, the race director, didn't want a woman in his race, so when he spotted Kathrine running early in the race, he physically attacked Kathrine. Kathrine's All American football player boyfriend separated Jock from Kathrine, so to speak, and when Jock remained on the ground, Kathrine and her boyfriend ran away from him. Kathrine spent the rest of the race thinking about how to make something of this incident (which was heavily photographed). She finished her first marathon, then ran 35 more marathons. And then? Kathrine has been spending the the rest of her life inspiring more than 1 million women in 27 countries, through the creation of the Avon Running program, to run and achieve their dreams. 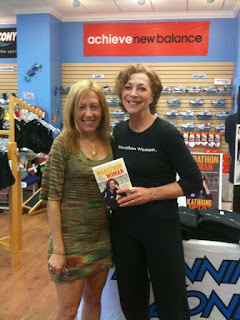 When I met Kathrine Switzer at The Running Zone, I told her what a huge inspiration she has been to me, not only in running but in working for women's equality. I brought my teenage daughter Liana to meet her too. 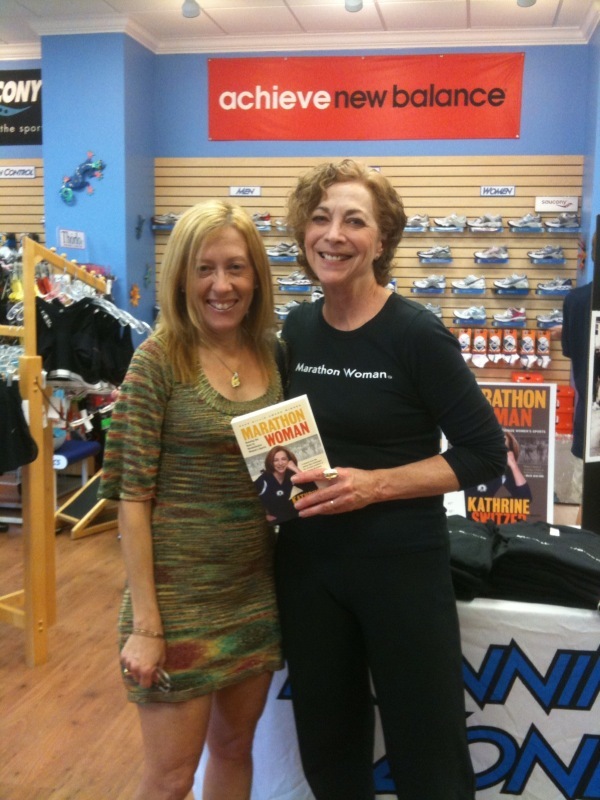 I cherish Kathrine's book, Marathon Woman, which she inscribed for me: "Cindy and Liana! To one who paves the way and the other who has no limits. Go for it! Kathrine Switzer, 11/18/09." When I run those 26.2 miles through Boston on April 18, 2011, I will think of Kathrine Switzer, who paved the way for me, and so many other women, all over the world. What is it about upstate New York? For me, that part of the country has always been magical. I spent many summers in rural NY, first as a camper, then as a counselor in training, then as staff, in the Catskill Mountains, at Camp Wawayanda. In the same beautiful green mountainous setting where Washington Irving penned "Rip Van Winkle" and other stories, I, too, seemed to escape from my daily routine and lived apart from real time for awhile, making friends, learning so many new skills, (I learned to shoot a gun! I rode a motorized mini bike, went horseback riding and bicycled countless miles on long bikes trips. Would I spend my adult years on such hedonistic pleasures?) and growing up to become the person I am today. Hiking up Slide Mountain too many times to count, that two week survival course in the woods, biking to Woodstock, those summer days washing pots and pans in the kitchen, telling ghost stories to the girls in my cabin around the campfire, singing campy camp songs in the dining hall at every meal, dancing with boys at the socials, and the incredible friends I made from all over the country - and the world - changed me for the better irrevocably. And then there was Chautauqua, another magical place where time stands still, located near Buffalo, NY, but miles away from any semblance of the real world. I spent a week at the Chautauqua Institute one summer as an adult, and that, too, changed my life forever. There at Chautauqua, at Highlights Magazine's annual Children's Writer's Conference, I learned how to write and prepare for publication children's books. But that was only a small part of what I learned at this venue. There, among the rolling green hills and outdoor amphitheaters, on the campus we shared with artists, musicians, theologians, academics, and families on vacations, I found me again, the childhood me, the me who wasn't afraid to dream big and work to make my dreams come true. It was at sunset on Chautauqua Lake, on a boat with about a dozen other writers and the publisher of Highlights Magazine, that I vowed that I would believe in me and my goals, no matter how crazy, and make them happen. So I did and as my list grows, so does my determination. How could I ever forget Chautauqua, all those people I met there who still believe in the power of words and how they can enhance and change kids' lives, and our lives too? One of those items on my list was to run a marathon, and what was supposed to be a check off the list item has turned into a consuming passion. 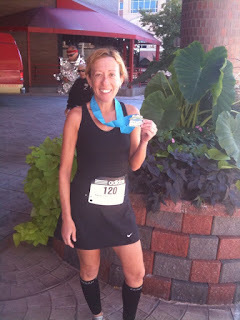 After I ran my first marathon, Disney World in January '09, I was hooked. I actually wanted to run with thousands of strangers for 26.2 miles, at least once every year. I wanted to test myself and run to my limit, and even beyond. And I wanted to get stronger and run faster every year. And someday, maybe, as we say here in the rural south, if the creeks don't rise and the good Lord is willing, I wanted to reach the pinnacle of our sport, to qualify for the Boston Marathon. The New York City Marathon, documented in the post below this one, was clearly one of the great times of my life. But on 10/10/10, in a small race in upstate New York, the stars aligned and the magic of that region worked for me yet again, it what became the Race of My Life. I stood at the Mohawk Hudson River Marathon starting line at 8:30 AM in Central Park in Schenectady, New York, shivering in 37 degree cold weather. The gun went off, and within a minute I was off and running with about 1500 of my new best friends. In a small marathon like this one, there was no need to wait an hour or an hour and a half for all the tens of thousands of people ahead of me to run. There were no corrals to wait in, no marshalls checking my number to see if I could start early. At Mohawk we just lined up wherever we wanted, starting whenever we wanted. I felt like I was at a 5K race back in Brevard. I half expected to see The Running Zone's start gate and finish line here in upstate NY. By mile 2, I had shed my two jackets and sweatpants. By mile 4 the gloves came off, and by mile 5 I felt my toes again. Was it possible that the temperature had already risen to the 50 degree mark, the perfect temperature for a marathon, the point where the body doesn't have to expend any extra energy heating up or cooling down? It must have been, because I was running fast, faster than I had ever run in a marathon or even in my training long runs, and I felt like I could run like this forever. Unlike the Disney World and New York City Marathons, there were not thousands of spectators lining all the streets. There were just a handful of family members along a few of the roads, holding up signs saying "Go Mom" or "Boston - I have a feeling..." No high school bands, professional orchestras, or street musicians played their music to keep us going. I pods weren't discouraged as in New York City, but were forbidden, so we didn't have that music to listen to. Even the other runners were not running to amuse me - I counted exactly zero costumes on my fellow marathoners. This was A Serious Marathon. For the last few years, Marathonguide.com ranked Mohawk Hudson River as one of the top fast marathons in the country, with a 370 feet net elevation loss, in which to qualify for Boston. And that is what most of the runners were quietly trying to do, here on bike paths from Schenectady to Albany, with little to look at but trees blazing with red, orange, yellow, green, and brown leaves, and the Mohawk and Hudson Rivers on our side, the sun shining on the water as it shone on all of us. Sometimes we ran through neighborhoods, with a few people cheering for us on lawn chairs outside their homes. But most of the times it was just us runners, running through the woods, with only the sound of our own breathing in our ears. Except for the time when we had to stop for a train going right through our path (52 seconds was deducted from my time during the stop), and when we ran right by the Watervliet Arsenal, the nation's only large bore cannon manufacturer, still a major producer of munitions, this was mostly a run through the woods and rural streets. So I was running fast, later I found out a 9:10 minute per mile average, and that includes stopping at all the water stops, manned by those impossibly helpful and friendly volunteers, every 2 miles, where I'd grab a small paper cup and water and enjoy one of the 13 Gu's, or energy gels, I carried with me. Although there were times I wanted to stop just to enjoy the sheer beauty of the trees and rivers, I kept going, impossibly fast for me, until I saw the skyline of downtown Albany, where I ran as fast as could toward the finish line. I saw as I finished I was well under the 4:05 that I needed to qualify for Boston. My final time turned out to be 3:59:12. Doug, my running coach, crunched the numbers, knowing what my best 5 K was, and had told me before I left that I could run a marathon under 4 hours. And Larry, without knowing the math, but knowing me, told me I could and would qualify for Boston at Mohawk. Me? I just kept going. I kept running, loving every minute of being lucky enough to be able to run a marathon, loving the scenery, the energy of all the other runners, feeling their hopes and dreams and ambitions merging with mine. When I saw that Albany skyline, and then saw the time clock at the finish line, I knew I did it, and spoiled my finish line picture by crying - with happiness, with relief, with gratitude towards everyone who got me to this finish line in this amount of time. Later I got a picture of me in front of the Crowne Plaza Hotel in Albany, smiling and holding my medal. That's the picture I framed and put in my library alongside the other pictures from my other two marathons. But the picture of me crying as I broke the 4 hour mark, qualifying for Boston? I hid that one in my bookshelf. 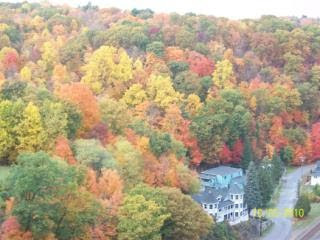 I look at it from time to time, and I remember how the magic of upstate New York worked for me once again.